My mum has this saying: "Little things please little minds, little trousers fit little behinds." Thinking about it, it's probably not true. Only the other day I saw someone on BoardGameGeek arguing that one game was better value compared to another because it physically weighed more. But anyway, for the sake of this bit, let's say that most people like little things. Babies, kittens, Fun Size Mars Bars... You name it. Just don't name mobile phones. They seem to be getting bigger again. Like they were in the 80s. Everyone liked big stuff in the 80s. I feel like this intro is getting away from me, so I'm going to press on. Everyone likes little things. Surely that's part of the reason micro games are so popular. There's something very special about being able to generate hours of entertainment out of just a few cards and a lean rules set. Games like Coup and Love Letter are obvious examples, but one that really stands out for me is Welcome to the Dungeon. Which is convenient, because that's the game I'm reviewing. Welcome to the Dungeon is a little game of little decisions in a little timeframe, with a big payoff in fun. 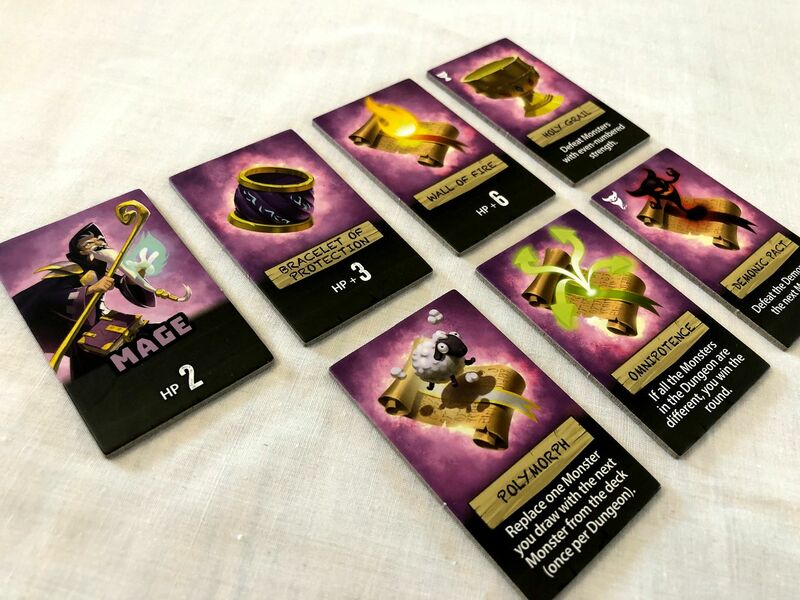 In terms of components, you get a handful of chunky tokens depicting four archetypal heroes and a selection of their equipment, and a small deck of cards depicting the denizens of the dungeon. All your usual suspects: Goblins, orcs, skeletons, dragons. That sort of thing. Why don't I eat Angel Delight anymore? Anyway, that's pretty much it for game components, besides a few cards for tracking successes, and four player aids that list all of the monsters in the monster deck, their exact quantities, their power levels, and any weapons they're weak against. We'll get to that in a moment. 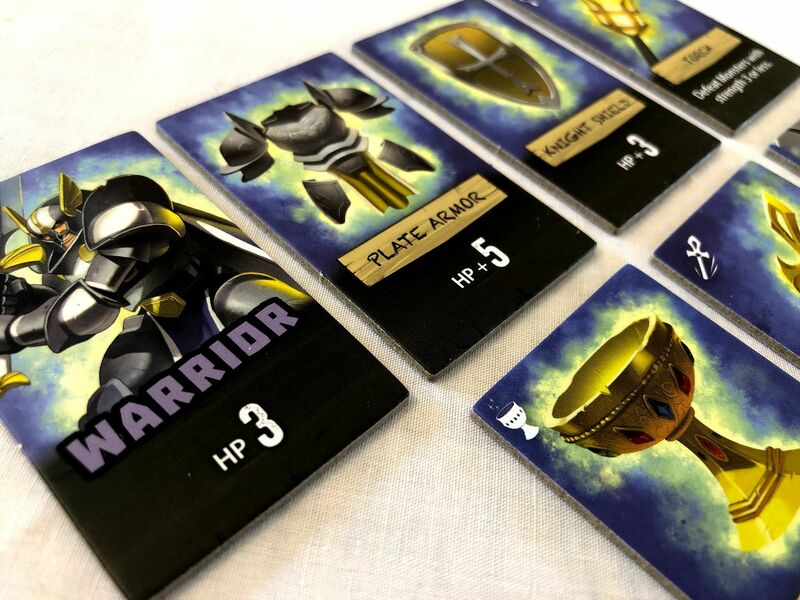 To start playing your first game, you shuffle the deck of monster cards, pick a hero, put the appropriate hero token on the table, and then lay out the six equipment tiles associated with that hero. And then you have a long conversation with everyone as they furrow their brows and scratch their foreheads and try to comprehend the idea of a communal hero that isn't really a communal hero in a dungeon crawling game that isn't really a dungeon crawling game. Yes; this is a game for up to four players. Yes; there are four heroes in the box. No; players don't control their own heroes. There's only ever one hero in play at any one time, and at the start of the game, no player is controlling that hero. A player only takes control of a hero following a round of bidding-type-bluffing-type-pushing-your-luck-type-shenanigans. I do love a good shenanigan. The hero token just has a picture of the hero on it, and a number of hit points. Each of the six equipment tokens provide bonuses for the hero, such as additional hit points, or the ability to instantly slay a monster of a certain type. So, at the start of the game you have a badass hero with a combination of tools and weapons ensuring any monsters don't stand a chance. Fortunately, this rather dull situation won't last long, because you're now ready to bluff and bludgeon your way through the dungeon. On your turn, you either pass (in which case you take no further part in the round), or you draw the top monster from the monster deck. If you draw a monster, you make a simple decision: Either add the monster facedown to a pile representing the denizens of the dungeon, or remove the monster from the game. Either way, only you know what monster is on the card. And here's the hitch: If you remove the monster from the game, you also have to remove one of the hero's equipment tokens. Eventually all the players except one will pass, at which point the sucker... I mean, brave hero... has to go into the dungeon. Our intrepid adventurer, who is probably wearing a red shirt, starts flipping the monster cards added to the dungeon throughout the course of the round, and deals with them one by one. If the hero has a piece of equipment to help, the player has the option of using that equipment; otherwise, the hero takes damage equal to the power level of the monster. If, at any point, damage exceeds the hero's hit points, the hero dies and the controlling player loses a life. If a player loses two lives, he or she is out of the game. If the hero fights through the dungeon and slays all of the monsters, the player gets a success card. Two success cards wins the game. Regardless of whether the hero lives or dies, a new round then begins. The monster deck is reshuffled, and a new hero selected. And that's all there is to the game. Basically, you make (a maximum of) two decisions. Add a monster to the dungeon; remove one of the hero's items. But that's not really all there is to the game. Not at all. This game is about taking a long look at a card. Narrowing your eyes slightly. Smirking at the other players. Casually dropping the card into the dungeon deck. Sipping your drink while your opponents do the same. Ditching the next card you draw without much more than a sideways glance, and then removing the dragon-slaying spear from the hero's available equipment. Sitting quietly while all the other players drop out of the round because you've obviously loaded a dragon into the dungeon. And then grinning like an idiot as you reveal you only put a weak goblin in the dungeon making it possible for you to waltz to an easy win. Because you don't play this game. You play your opponents. This game isn't about what's happening on the table; it's all about what's happening in your mind. More importantly, what everybody else thinks is happening in your mind. You see, if you pass, you're out of the round. If you're too cowardly - if you never put your neck on the line - you're never going to be in with the chance of winning a success card. But maybe that's okay. If all of the other players die twice, you win by default (the two sweetest words in the English language). So, maybe the meek inherit the Earth (or at the very least, inherit a dungeon full of heroic corpses). Maybe all you have to do is loiter at the back while people braver and more foolish than you throw themselves into the meat grinder. But, then you've got another concern... When, exactly, do you throw in the towel? You don't want to pass immediately, because then you're putting all your chances of winning into the hands of the other players, giving up all the agency that comes from being the one calling the shots. You want to stay in the round for a while, making sure you add some tough monsters to the dungeon or take away the most useful equipment. You want to set the dungeon like a trap. But, what happens if you're still priming the trap when everyone else wanders outside for a cigarette break? If you stay in the round too long, you may end up having to face insurmountable odds with only your winning smile and can-do attitude to see you through. You could be your own worst enemy, crushed in your own carefully constructed trap like Wile W. Coyote crushed under one of his ACME-branded boulders. Then again, you may decide that discretion isn't the better part of valour. 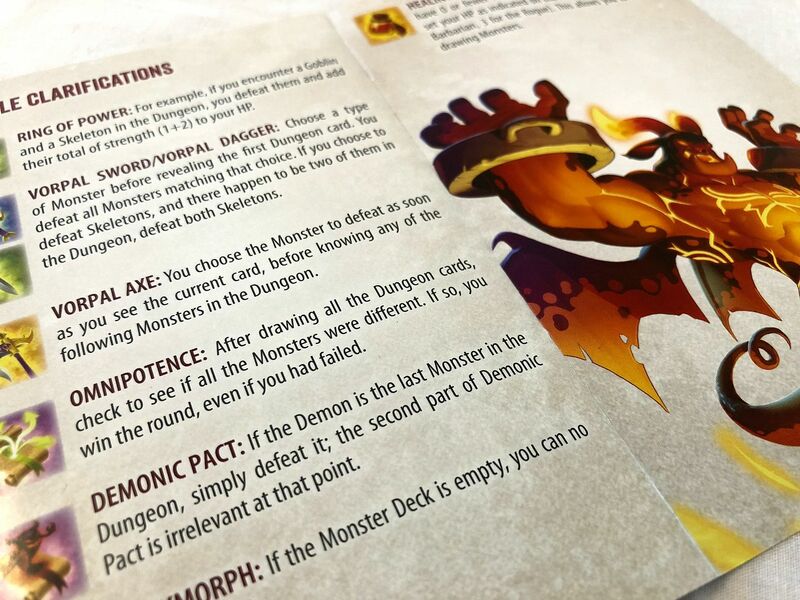 After all, every time you draw a monster and add it the dungeon, you have valuable information about what's awaiting you in the dark; and you know what equipment you need to defeat it. You have a better idea of when to cut your loses, but you also have a better idea of when the dungeon is ripe for the taking. If you know you've added strong monsters, but the tools for dealing with those monsters are still available, you can bluff it out. You can watch as weaker players balk at the challenge and flee, leaving you to stride into the gloom to meet your destiny. I could go on, but I'm sure you get the point. This is a game about thinking and double thinking. About out-thinking your opponents. And then rethinking your life choices. And yet... it's also not really a game about thinking all that much at all. While it's fun to play psychological games with your friends, at the end of the day, this is still a filler game. A micro game. It's not a brain burner. It's fast and fluffy. An excuse for smack talk and bawdy tavern tales. A way to kill 10 minutes while you're waiting for the rest of your gaming group to arrive. You aren't going to agonize over your choices all that much. You aren't going to spend minutes plotting your optimal move. Because while this game gives you perfect information about what may potentially be in the dungeon, it provides incredibly limited information about what actually is in the dungeon. While the two-player game offers some interesting scope for mind games and some tactical play, once you're playing with four players it all becomes a bit crazy and chaotic. 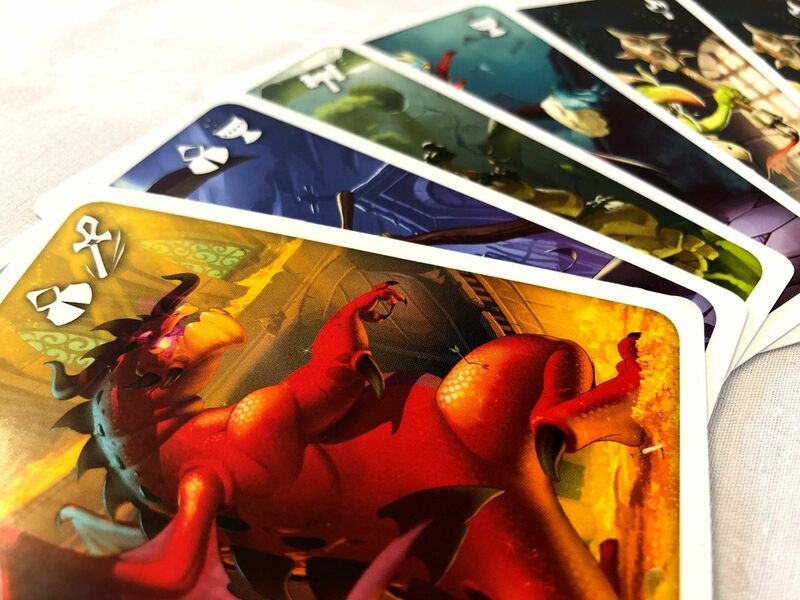 With four players, for every card you put in the dungeon, there are up to three cards you don't know anything about, making it very difficult to measure your chances of success. Furthermore, with three players taking actions between each of your turns, your window for bailing out of the round is very narrow indeed. Sometimes it's non-existent, and you have to pass earlier than you really wanted to just to ensure you don't get lumbered with dangerous dungeon duties. For me, three players is the sweet spot. With two, the game is suitably cutthroat but also very brief as each round is over as soon as one person passes; and with four it's much harder to get an idea of what's going on inside the dungeon. With more players, there's also more risk of player elimination, with one or two players having to sit out a few rounds. Really, that makes Welcome to the Dungeon a bit of an odd duck (or a platypus). A social game that seems to play better with fewer people (or, at the very least, plays differently; you may very well prefer the added chaos and confusion from having a full complement of players attempting to stab each other in the back). A game that's a bit too thinky to play thoughtlessly, yet far too lightweight to play endlessly. And honestly, I don't think this game stands up to extended play. It's a fun five minutes. One of those games you keep around to fill a space in your schedule; not one of the games you build your schedule around. It doesn't offer endless replayability. At best, it offers four heroes that play quite differently (unless you invest in Welcome Back to the Dungeon, which gives you another four heroes). That's a point, I should talk about the heroes. They're all quite fun and thematic, and the hero you pick for each round completely changes your strategy. They aren't all created equal. Vorpal sword: Defeat one monster you select when entering the dungeon. As you can see, most items kill a specific enemy, and once he's going into the dungeon, the only decision he has to make is which type of enemy the vorpal sword can kill (assuming he still has the vorpal sword). Once he's in the dungeon, it's just a matter of flipping cards and muscling through the opposition. For all the different stuff the heroes have access to, each game round is effectively the same as the last. The game doesn't change things up all that much, and that means you have to change things up for it. And the only way you can really do that is to change the people you're playing with. Play for long enough with the same group of people, and there's a good chance that group will settle into certain patterns. You know that Jim always puts in the dragon. You know that Sally always drops out once there are eight cards in the dungeon. You know that John thinks the rogue is the weakest hero and is going to play the waiting game to hope everyone else dies first. Of course, play with a fresh group, and you're in uncharted territories. How well do you really know these people? How can you bluff people when you don't know their tells? And that's Welcome to the Dungeon in a nutshell: A game all about finding the right balance in all things. Ultimately, it ticks all the right boxes for what it's trying to achieve. It's compact, portable, easy to teach, quick to play, encourages players to constantly engage with what's going on, and offers just enough decision points to keep things interesting without slowing down gameplay. And I do love it. Of course, it's not going to be everybody's cup of tea with a custard cream on the side. But if you like filler games that squeeze a lot of laughs out of just a few rules and components, this one has to be worth consideration. 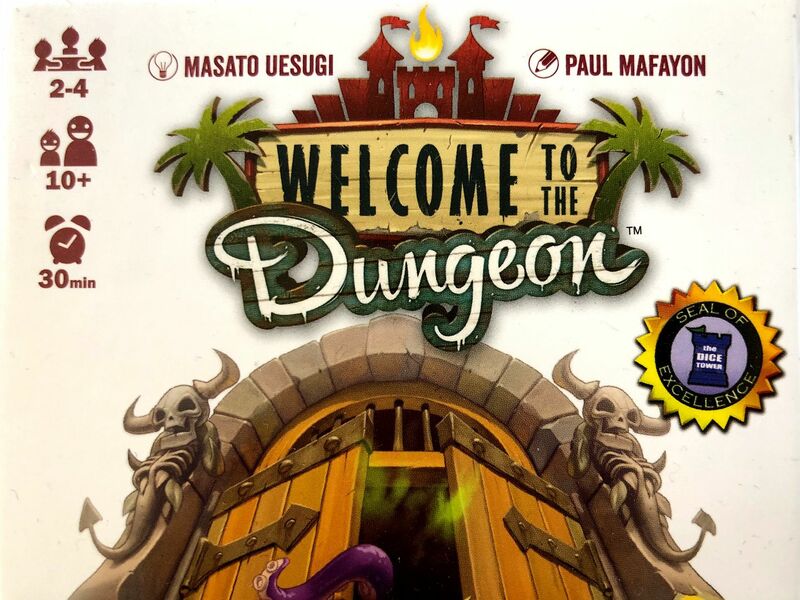 Welcome to the Dungeon is not a game you're going to play all the time; it's not even a game you're going to play most of the time; but it's a game you can play anytime. And it's always going to make you feel at home; just so long as you don't outstay your welcome. 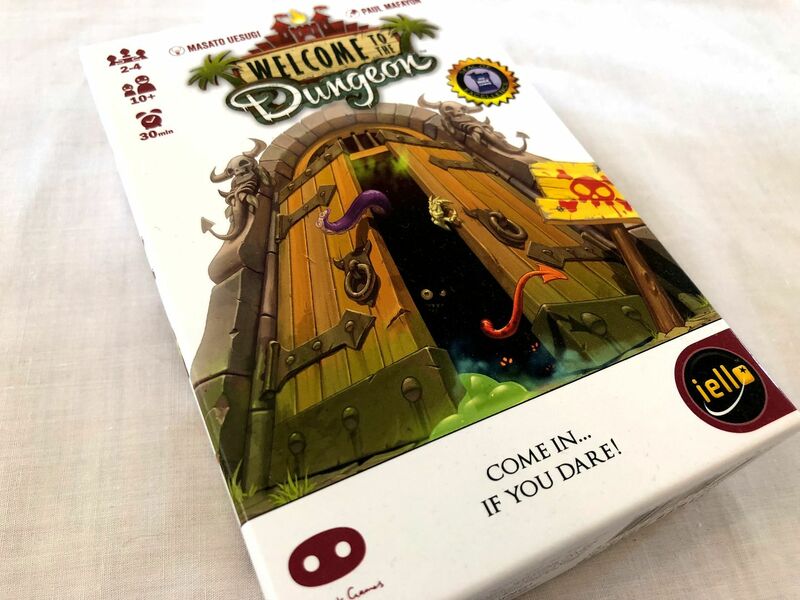 Great games like Welcome to the Dungeon are available from all good (and some rubbish) games stores, and they're also available online from lovely people like the folk at Element Games.